Overall, the Husqvarna 240 chainsaw is great to use around the house for light and medium-duty purposes. While it’s not as powerful as many commercial-grade chainsaws, it provides more than enough power to slice through branches and small stumps. Lightweight, ergonomic, and easy to use, it’s a great gas chainsaw to have on hand in the case of cutting emergencies. 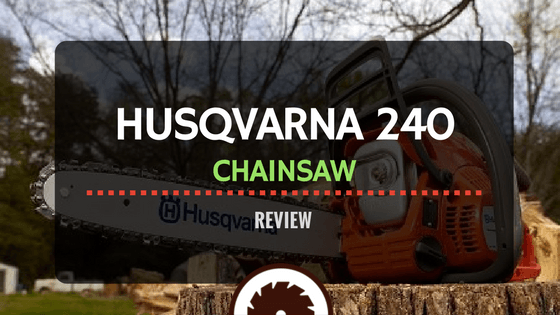 Let’s start our Husqvarna 240 chainsaw review by talking about the chainsaw’s overall design and construction. To put it simply, this chainsaw is ridiculously easy to handle. Regardless of your strength or size, it can be easily balanced in your hands to allow for precise and accurate cutting. With a powerhead made out of tough and durable plastic, this chainsaw is designed to withstand great amounts of wear and tear. One of the excellent features possessed by this chainsaw is its centrifugal air cleaning system. This cleaning system makes use of internal air to push out any stray dust or debris which might makes its way into the motor. By doing this, the chainsaw prevents debris from coming into contact with the cleaning filter. The less debris that comes into contact with the cleaning filter, this less you’ll have to change the filter in the long run. This saves not only effort, but time as well. Equipped with a series of handles, the 240 is easy to grip and stabilize. It possesses one handle which wraps around the top of the powerhead to the bottom of the left side, allowing you to position your left hand as needed. Its other handle is equipped toward the back of the powerhead, allowing you to grip it tightly with your right hand at all times. Another feature that makes it easy to handle is its low-vibration design. Possessing a compact design, it centers all vibration, ensuring that it doesn’t transfer to your hands. Available with bars of 14 inches, 16 inches, or 18 inches, you can easily find a 240 to suit your specific needs. Now, let’s talk about how easy the Husqvarna 240 chainsaw is to use. While it’s not quite as easy to use as some higher-end chainsaws, it’s still fairly simple for most users to operate. This is so for a few different reasons. Let’s first talk about its combined choke-stop feature. This feature allows you to start the engine and turn it off abruptly with the same button. Easily-accessible next to the chainsaw’s back handle, it can be pushed up to assist in starting, and pushed down to assist in abrupt stopping. This will reduce engine flooding, helping to maintain the overall health of the chainsaw through time. Another useful and helpful function of the 240 is its tool-less tension adjuster. Positioned to the front left of this saw’s powerhead is an easily turnable swivel adjustment. This adjustment allows you to alter the tension of the chain at any given time. You don’t have to go to the shed to find a specialized tool because the specialized tool is built into the chainsaw itself. Weighing in at just 10 pounds, this chainsaw is ridiculously easy to handle and stabilize. To get it started, you simply apply its choke, pull on its rope starter a few times, and you’re ready. It’s fired up and ready to cut any small or medium wood pieces in sight. For a chainsaw at its price range, it’s very easy to use. Next, let’s talk about how the Husqvarna 240 chainsaw is powered. First, we should note the most important part: the 240 is a gas chainsaw. It takes gas in order to make it run. Its tank measures in at 0.14 US pints; a relatively normal size for a chainsaw’s gas tank. However, due to its extremely efficient motor, this saw does not consume much fuel at all. This will allow you to use it for much longer periods of time than other chainsaws of its ilk. In addition to using very little fuel, it also produces very little gas emissions. Designed to meet the strictest of environmental standards, it’s as environmentally safe as any gas chainsaw you’re going to find. This chainsaw’s motor outputs 2 horsepower and is capable of moving its chain at 9,000 rotations per minute. While it’s not on the power level of high-end, commercial chainsaws, it works extraordinarily well for small and medium cutting jobs. As we just mentioned, the Husqvarna is not quite on par with commercial, high-end chainsaws when it comes to power. However, that doesn’t mean that it lacks overall cutting ability. When it comes to small and medium size cutting purposes, it excels over many chainsaws of its kind. This is the case regardless of which bar length you’re using. The 14-inch and 16-inch bars can make it through everything from small branches, to stumps, to firewood, and more.The Husqvarna 240 18 inch bar can make it through all of these things, and in some cases, even more. It should, however, be noted that this chainsaw is not designed to handle large trees. While you could conceivably use it for that purpose, it’s going to struggle. Overall, using it for large cutting purposes is not recommended. To keep your hands safe and protected during use, this chainsaw is equipped with a safety guard. Strategically placed at the top of the powerhead, this safety guard prevents your hands from getting into the chain, while keeping debris from blowing back onto your body. Again, while the 240 isn’t on par with commercial-grade chainsaws, it works remarkably well for what it’s designed for: small and medium cutting purposes. Whether you buy battery-powered, electric, or gas-powered, your chainsaw is going to be LOUD! There’s little you can do to avoid this. The nature of the tool is inevitably going to result in loud (and annoying) noises. That being said, let’s talk about how loud the Husqvarna 240 chainsaw gets. At its max, it can reach decibel levels of 113. While this isn’t as loud as some chainsaws, it’s still on the very loud side. If we were to compare it to something, we would compare it to a standard rock concert.In the end, noise should not be a huge deterrent when choosing a chainsaw. You can always wear earplugs to help block out the noise if need be. The only thing you might want to consider is whether or not it’s going to both your neighbors. As far as that goes, this chainsaw is fairly standard. Sure, they’ll hear it, but it won’t be much worse than if you were mowing the lawn. This section will focus on several chainsaw models that compare to the Husqvarna. Some of the models discussed have similar features, and only minor differences can be noted between them. The Stihl 170 is a lot like the Husqvarna 240 in that it’s a gas-powered chainsaw which is great for small and medium cutting purposes. However, there are some differences between the two chainsaws. Let’s discuss them, shall we? Where the 240 beats the Stihl 170 is in its power. Whereas the 170 produces 1.7 horsepower, the 240 produces 2 horsepower. This ultimately allows it to cut through woods with more stability and ease, lending itself to more accurate and precise cuts. Also, whereas the 240 possesses a tool-less chain tension adjuster, the 170 does not. You must make use of a tool in order to adjust tension of the 170’s chain. Overall, the Husqvarna 240 chainsaw reigns supreme over the Stihl 170. While both are terrific chainsaws for periodic, at-home use, the Husqvarna is just a little more powerful and easy to use. Considering that they’re both available for around the same price, we recommend that you go with the 240. However, if you’re on the small side, and would like a chainsaw that you can easily handle, the Stihl 170 would also be a great option for you. Next, let’s compare it to the Stihl MS 180. This is the competitor chainsaw that compares most favorably to the Husqvarna 240. Both chainsaws are around the same size, both weighing in at close to 10 pounds. They also possess nearly equal lengths, allowing for comparable handling and stability. In addition to this, both chainsaws provide around the same amount of power. Each chainsaw produces 2.0 horsepower, allowing them to cut through small and medium size wood pieces with general ease. However, like the 170, the Stihl MS 180 does not possess a tool-less tension adjuster. The 240, of course, does. This might not make a huge difference for you, but if it does, it’s important to remember. Our last matchup involves the Stihl 171 against the Husqvarna 240 chainsaw. The Stihl 171 is similar to the 170, but with a few differences. First of all, it’s a little more compact than the 170, making it a lot more balanced overall. However, it actually weighs more than the 170, coming in at around 9.5 pounds. In terms of weight, this makes it more comparable to the Husqvarna 240. The Husqvarna is more powerful than the 171, producing 2.0 horsepower, compared to the 171’s 1.7 horsepower. While they can both make it through wood with general ease, the 240 is just a little easier to stabilize for precise and accurate cutting. Also, like all gas-powered Stihl chainsaws, the 171 does not possess a tool-less tension adjuster. Having to get a tool every time you want to tighten up the chain can get a little annoying. The Husqvarna’s tool-less adjuster takes away this annoyance.